Senior B-back David Sims finished with 99 rushing yards and two touchdowns as the Jackets defeated North Carolina 28-20. It was the fifth consecutive win for the Jackets against the Tar Heels and improves Tech’s current record to 3-0 (2-0 ACC). Redshirt sophomore quarterback Vad Lee was 7-12 through the air for 104 yards and a touchdown. With the help of three penalties by Tech, North Carolina marched 58 yards down the field on the first possession of the game, scoring on Romar Morris four-yard touchdown run. The Tar Heels would lead 6-0 after a failed two-point conversion attempt. North Carolina forced a three and out on the Jackets’ first possession, but then the Tech defense followed up with a three and out of their own. On Tech’s second possession, the Jackets lined up to punt, but instead ran a fake. Punter Sean Poole’s run was long enough to pick up the first down, but was negated on a holding penalty by Louis Young. Luckily for the Jackets, a dead ball personal foul was called on the Heels resulting in a Jacket first down on their own 27. The drive would eventually end on a Vad Lee fumble, recovered by North Carolina on their 46. The Tar Heels would turn the turnover into a touchdown to go up 13-0 with 0:29 remaining in the first quarter. On fourth and goal from the one, a one-yard touchdown run by Sims with 11:13 remaining in the second quarter would finally get the Jackets on the board and cut the lead to 13-7. It was a gutsy call by Johnson, but he knew it was the right one, not even considering kicking the field goal. “No. If we can’t gain half a yard, then were probably not going to win. And the way that game was looking at that time, field goals weren’t to do any good,” Johnson said. It would take North Carolina only 2:06 to march down the field and score a touchdown on a Bryn Renner pass to Sean Tapley to put the Heels up 20-7. On Tech’s next possession, a 21-yard touchdown pass from Lee to junior receiver Darren Waller just before halftime cut the lead to 20-14 heading into the locker room. After a Tech three and out to start the half, North Carolina appeared as if they had broken the game open when Renner connected with Ryan Switzer for an 82 yard touchdown pass which would have put the Heels up 27-14, but the play was called back due to a holding penalty on tackle Jon Heck. 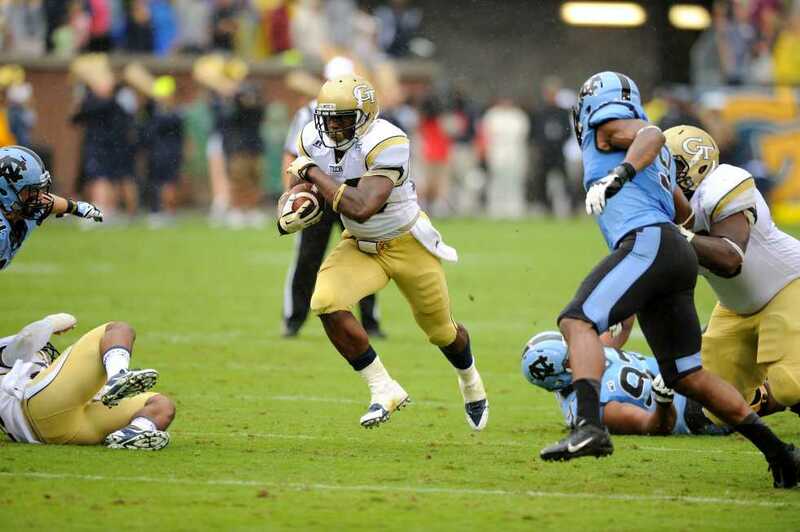 The drive would end in a punt for the Tar Heels, and the Jackets would take over on their own 47. Four minutes and 38 seconds later, Lee would score on a quarterback sneak from the one to give the Jackets their first lead of the game, 21-20. Two possessions later, Sims would add his second rushing touchdown of the day to put the Jackets up 28-20 with 13:22 remaining in the game. North Carolina was marching down the field looking to tie it up, but Renner was picked off by cornerback Louis Young on the Jackets’ 38. After the Tar Heels forced Tech to punt, they would get one more chance to tie it up, but the Jackets forced a three and out and got the ball back with 6:27 remaining. That would be all the Jackets needed as they used 13 plays to run out the clock and win the game. The Tech defense shutout North Carolina in the second half and only allowed Renner to throw for 41 yards, opposed to 178 yards he racked up through the air in the first half. The Tech defense also forced North Carolina into going 0-4 on third down conversions in the second half.